I'll take solid characterization over incessant action any day. I said Scott's characterization is small details because his characterization has been solid since day one of Bendis writing him. Scott has not waivered or flinched in his motives or purpose and if you take into account all the events that have happened thus far (whether you agree with them or not) where his now and how he acts makes total sense. 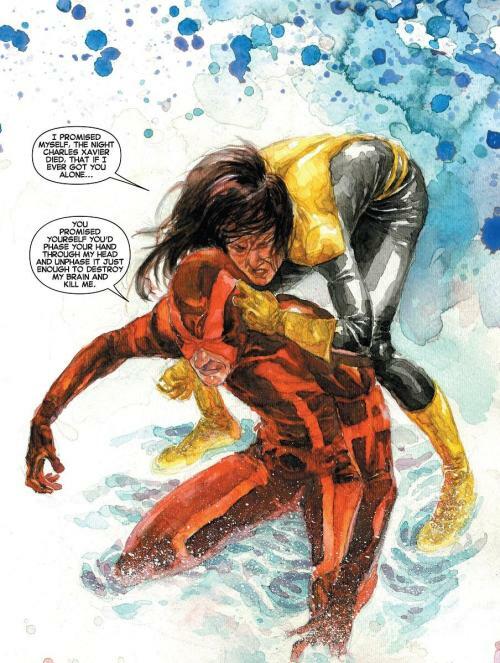 Ult_Sm86 wrote: I said Scott's characterization is small details because his characterization has been solid since day one of Bendis writing him. Scott has not waivered or flinched in his motives or purpose and if you take into account all the events that have happened thus far (whether you agree with them or not) where his now and how he acts makes total sense. Scott is not the only character on the page. I'll agree that his characterization has been consistent, in that he consistently doesn't really seem to have a coherent purpose beyond being a self-proclaimed revolutionary who goes around functionally kidnapping new mutants. I think he seems lost, but he probably should. Let's keep in mind, of course, that very little time is meant to have passed since the relaunch. It's been a year for us, but it's probably only been a month or so for them. I actually tried to figure out the amount of time that passed between Kurt's death and his appearance at the end of the "Hellfire Saga" and got 9-12 months. At the same time, I did my very best to figure out his age and came up with 27. I wanna see Kurt smack Scott upside the head. That would make me very happy. I humbly apologize and offer my regret for lashing out at Scott and for not fully considering the depth and history of his relationship with Kurt. Nightcrawler says, "Odd how even in the face of tragedy, there are often such wonders...such miracles...to be found"
Scott "We fnd them where we make them. I don't think anyone knows that better than you and I. But tell me...how are the other members of Excalibur?" Scott "Mutant is another word for change Kurt...It's our ability to do so that keeps us going." Kurt "That is kind of you to say Scott...But as leader of the X-Men, you have never had to deal with your team dissolving out from under you." Scott "You'd be surprised...There was more than one time the bottom nearly dropped out from under us...once, each of us choosing to GO OUR SEPERATE WAYS. With you as their leader, Nightcrawler...I'm sure Excalibur is more resilient than you might realize." In the final passage of this book Kurt proclaims a bright new vision for his team and for himself as a hero. (In large part because of Scott's brotherly support) It's beautiful. This is the kind of reconciliation I hope for these two in the future. Kurt "Danke Scott...Kitty, Rachel and I have discussed that Excalibur might function best...here...the enchanted blade serving as a metaphor for a scalpel, if you will, cutting deep between the cracks of the X-Men, X-Factor and X-Force....The world is getting smaller Scott...everyday. The global make-up of the Acolytes alone should indicate that there are mutants across the planet who have never heard of Charles Xavier and his dream of genetic harmony between homo-sapien and homo-superior. It falls to us to cut a swath of tolerance and understanding through the blanket of ignorance that often separates our two races." Oh my! I think they are! But how will it work? I mean that's Aaron's last ish isn't it? There's no way he did all this in one ish! Oh, that means K&Y are gonna 'really' do it...well, that makes sense...that's fitting. That's actually really intriguing. But it feels like too much all at once...at this pace...this sort of rush to do it all now...it's like i can hear the timer ticking down...pacing is what gives a comic longevity and it's a double-edged deal in today's market...nobody has long to establish their title without well, unless it's Bendis...but to actually make a title important...it has to have a sense of presence and confidence...it has to be able to offer a real 'moment' here and there...not just a rush to short finishes...that feel like races from one short pier to the next. Don't you dare make me buy this title! Why you gotta do that?